TO PREPARE THE WILD RICE: PLACE THE RICE IN A FINE STRAINER AND RINSE UNDER COLD RUNNING WATER. BRING 1 QUART OF WATER WITH 1 TEASPOON SALT TO A BOIL. ADD THE RICE, REDUCE THE HEAT, AND SIMMER, PARTLY COVERED, UNTIL TENDER, 35 TO 40 MINUTES. WHILE THE RICE IS COOKING, MELT 3 TABLESPOONS OF THE BUTTER IN A SMALL HEAVY SAUCEPAN. ADD THE ONIONS AND COOK SLOWLY, STIRRING OCCASIONALLY UNTIL GOLDEN BROWN, 15 TO 20 MINUTES. SET ASIDE. DRAIN AND SPREAD RICE ON A PLATTER. DICE THE TWO REMAINING TWO TEASPOONS OF BUTTER AND GENTLY FOLD INTO THE RICE ALONG WITH THE BROWNED ONIONS USING A FORK. TASTE AND ADJUST SEASONINGS. TO PREPARE THE SAUCE: HEAT PORT WINE IN A SAUCE PAN OVER HIGH HEAT. STIR IN TOMATO PURÉE. BRING TO A BOIL. RETURN TO A SIMMER UNTIL LIQUID REDUCES BY HALF. TASTE AND SESON WITH SALT AND FRESHLY GROUND PEPPER. KEEP SAUCE WARM UNTIL SERVING. TO PREPARE THE GOOSE BREASTS: COAT EACH BREAST WITH OIL AND SEASON WITH SALT AND FRESHLY GROUND PEPPER. ON A HOT GRILL, PLACE THE BREASTS SKIN SIDE DOWN. DEPENDING ON THE SIZE OF THE GOOSE BREASTS, FOR MEDIUM RARE, GRILL FOR TWO TO THREE MINUTES, TURN THE BREASTS AND COOK FOR ANOTHER TWO TO THREE MINUTES. REMOVE FROM THE GRILL AND ALLOW TO REST FOR FIVE MINUTES BEFORE SLICING. TO SERVE: WARM SERVING PLATES IN A 200 DEGREE OVEN. 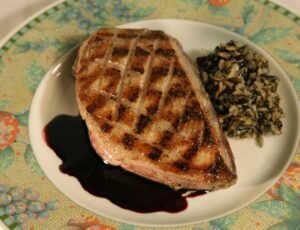 SLICE GOOSE BREASTS ON THE DIAGONAL AND PLACE 1/2 BREAST ON EACH WARMED PLATE. 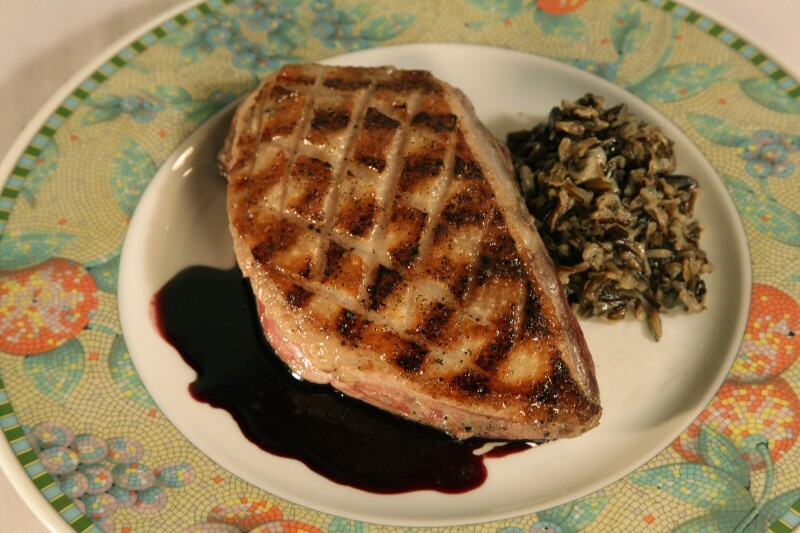 SERVE WITH THE PORT WINE SAUCE AND WILD RICE.